The clump birch is a nice tree to grow in your backyard provided you live within USDA hardiness zones 3 through 6. Its striking bark is especially decorative and the leaves are small and easy to clean up in the fall. Several of the birch species tend to grow well in clumps, but the gray birch has been termed the clump birch. You can train the clump or gray birch (Betula populifolia) to grow as a single trunk or clump tree, depending on your preference. Plant your trees as early in the spring as you can work the soil, or in the late fall before the ground freezes. Choose a site where the clump birch trees can get full sun and plant in dark soil with lots of organic matter. Clump birch will tolerate other soil conditions, even dry gravel, but it will do better with more soil and less rock. You can make a doubly large hole and add well-rotted compost in with the removed soil to enhance the mixture. Buy three clump birch tree plants, if you cannot find a clump birch sapling already growing in a clump form. Small saplings can be transplanted from other in-ground sites as long as you get as much of the roots as possible when you dig them up. Remove the saplings from their containers and take some of the soil from the root ball so that they can sit about 6 inches from each other in their planting hole. Keep the soil to add back later. Mound any extra dirt up around the base of the trees and then mulch it with at least 6 inches of root mulch. This will help conserve moisture around the plant as well as set it off in your landscaping. Water the clump birch and the ground surrounding the tree with a gallon of water for every 6 inches of root depth. Repeat every six hours during the day for the first week, and then once a day for another week. 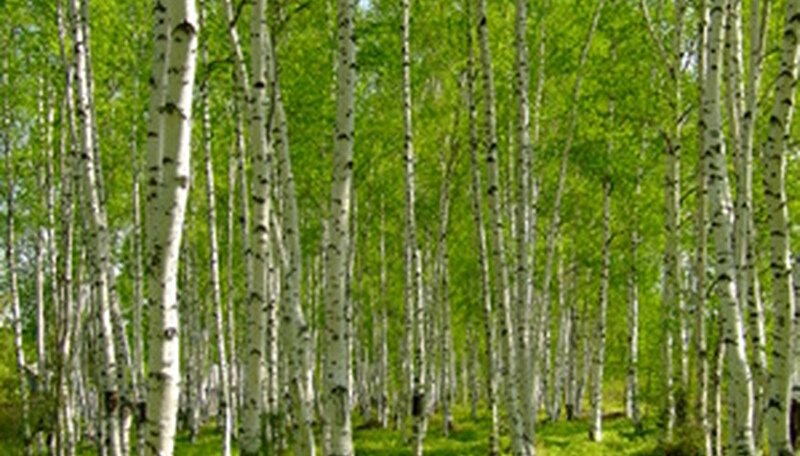 Birch trees need ample moisture so make sure the tree never dries out for the first year after planting. Do not fertilize the tree, especially for the first three months after planting, or you run the risk of burning the roots.